Having had two summers at Hilliers, Open Studio is back at Red Hot Press this year. Come on down this weekend to see - and buy - work by workshop members. Open Saturday, Sunday and Monday, 12 - 5pm. Meant to post this on Friday so apologies for lateness. 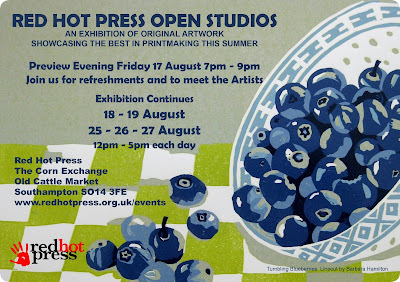 Still time today and tomorrow to see the show though. A good way to spend a rainy Sunday afternoon.